I am dying over this World Series Zombie costume from Living Locurto. I am honestly in pain!! Drew has already picked his costume for this year and it is a group costume with friends, so he can't change his mind, which means this costume is going to kill him too! Obviously, being in Texas, we are rooting for the Texas Rangers. Add to that the fact that last season he played on Cardinals and has the hat and the shirt so it would be SO easy to do. He would LOVE this costume!! Literally killing me...except not literally! You know what I mean! 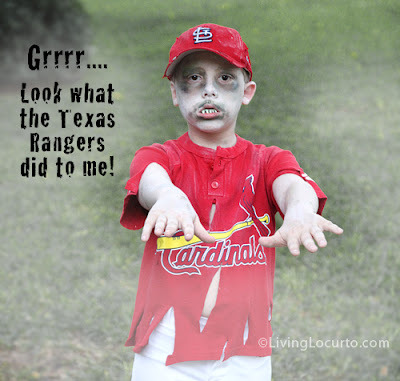 You can check out more fun photos of this St. Louis Cardinals Zombie costume over at Living Locurto. Hilarious! But I think a Rangers zombie would be more appropriate - complete with rabid squirrel! Go Cards! Go Rangers! Just one more game. We can do it. Like zombies, the Cardinals never die!